Home › ALL POSTS › Want to Help Humanitarian Operations in Libya using your Laptop? Join UN Volunteers Online Now! Want to Help Humanitarian Operations in Libya using your Laptop? Join UN Volunteers Online Now! The UN Online Volunteer Service (OVS) has now teamed up with the UN Office for the Coordination of Humanitarian Affairs (OCHA) and the Standby Task Force to support crisis mapping efforts in Libya. This means you can now join the UN as a volunteer to provide direct support to the humanitarian response in Libya. The Libya Crisis Map helps both OCHA and operational organizations like UNHCR, WFP and the Red Cross to both develop a better situation overview as well as complement traditional assessments in determining the most appropriate response to the humanitarian emergency. At the request of OCHA’s Information Services Section, the Standby Volunteer Task Force was activated to create and support the Libya Crisis Map. You don’t need any prior experience in crisis mapping. Our volunteer coordinators will give you all the hands on training you need so can start helping the humanitarian operations in Libya right away. The skills you learn will also serve you well in the future as more humanitarian, human rights, development and media organizations are looking for this kind of experience and skill set. More importantly though, you get to make a real difference! GOOD OPPORTUNITY TO SUPPORT AND SPREAD DEMOCRACY IN THE DIFFICULT AREA. I would really appreciate being considered to be one of the volunteers in the Libyan crisis. I give you kudos for the good works you are doing, more grease to your elbow. Count on me with full support and volunteer 24/7. I`m right herein Philippines, what help could i extend, contribute? lets join hands to spread democracy…. I’d be glade if considered as a volunteer and could help in this cause for bringing back democracy to Libyan people by any means…. I would really love to work on this UN mission and hope to bring things back in order. I have been a 5 star rated volunteer with UNIPC-IG and lets hope you guys will give me a chance to showcase my talent. Lets make world better, lets make Libya safer !! Super, thanks for getting in touch Avi. Just saw that you joined the Ning platform, thanks! I think that the existing infrastructure is not ready to handle the public request for volunteers. While it is an admirable effort, I feel strongly that the processes are not in place to manage training or control the random inputs at the moment. In the medium term, I see as much effort spent correcting and filtering reports as creating them. I would suggest a more robust recruiting effort for getting reports and an identifying mechanism so that consistent reporters can be invited to join. Hi Om, thanks for your feedback. By all means email me a Google Doc with details outlining a more robust recruiting effort for getting reports, identifying mechanism, etc. Many of us working on the Libya crisis map have been going non-stop for 11 days now, with little sleep. We had to turn around the new recruitment mechanism within an hour. So we haven’t had the luxury of taking a few steps back at this point. This is why I’d appreciate your help given that you feel you could do a better job. Please email me the Google Doc directly at patrick@crisismappers.net.. If you could set up the necessary Google Forms, spreadsheets, additional documents, etc that are needed to put your plan in action asap, I’d really appreciate that as well. Thanks again. ps. I’m curious why you didn’t email me your concerns directly, since you’ve had my email address for months and know how to reach me. Please let me know how to volunteer. I would love to help.. I love to help the people in libya.,.as a volounteer…please let me know. I am in Bangladesh, Manny BD people are live in libya, i want to help them and others. I’m tunisian , I live in south of Tunisia .Please let me know how to be volunteer to help refugees from Libya. Seems all the positions have been filled. Do you anticipate the need for more volunteers? If so, is there a waiting list? I would be interested in adding my name to that list. Thank you. 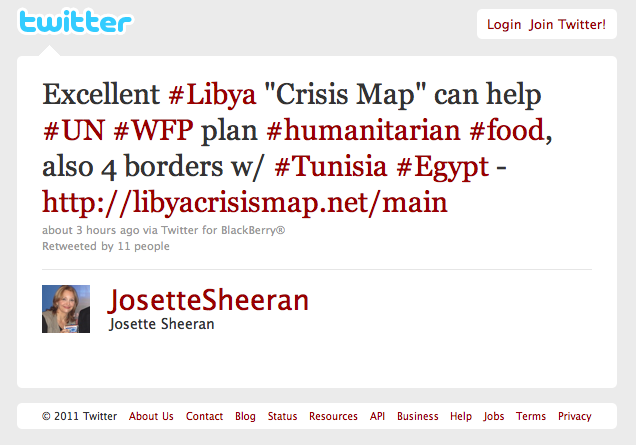 Please, consider having me join your mission in Libya to give a helping hand to those in need in that country. I am ready and willing to do whatever is asked of me to aid you. Once again, please reply and consider me. with regarding to the libyan war, we all your assisstance here in west libyan border, we suffer of alot difficults that have been increased due the war specially the injured and hurted rebiles who were fighting the gaddafi regime, also the refugees have siffered from many problems specially the life needs, such as shulters, food, and some fuel to the rebiles. i am working in National NGO in Bangladesh. I am living in Bangladesh. Would like to help people of libya. 5 Pings/Trackbacks for "Want to Help Humanitarian Operations in Libya using your Laptop? Join UN Volunteers Online Now!"